The ability of HIV-1-specific CD8+ T cell responses to recognize epitope variants resulting from viral sequence variation in vivo may affect the ease with which HIV-1 can escape T cell control and impact on the rate of disease progression in HIV-1-infected humans. Here, we studied the functional cross-reactivity of CD8 responses to HIV-1 epitopes restricted by HLA class I alleles associated with differential prognosis of infection. We show that the epitope-specific responses exhibiting the most efficient cross-recognition of amino acid-substituted variants were those strongly associated with delayed progression to disease. Not all epitopes restricted by the same HLA class I allele showed similar variant cross-recognition efficiency, consistent with the hypothesis that the reported associations between particular HLA class I alleles and rate of disease progression may be due to the quality of responses to certain “critical” epitopes. Irrespective of their efficiency of functional cross-recognition, CD8+ T cells of all HIV-1 epitope specificities examined showed focused TCR usage. Furthermore, interpatient variability in variant cross-reactivity correlated well with use of different dominant TCR Vβ families, suggesting that flexibility is not conferred by the overall clonal breadth of the response but instead by properties of the dominant TCR(s) used for epitope recognition. A better understanding of the features of T cell responses associated with long-term control of viral replication should facilitate rational vaccine design. Virus-specific CD8+ T cells are critical for control of HIV-1 and SIV replication in vivo (1, 2) but are insufficient for eradication of the virus. In the absence of therapeutic intervention, the vast majority of HIV-1-infected individuals ultimately progress to AIDS, although the rate at which disease progression occurs varies markedly. Currently, there is much interest in the field in defining qualitative aspects of the HIV-1-specific CD8+ T cell response that are associated with differential restriction of viral replication and variation in disease course. Indeed, a better understanding of the “type” of T cell response required for long-term containment of HIV-1 replication is essential for rational vaccine design. Several mechanisms may contribute to the inability of the host immune response to contain HIV-1 replication completely (reviewed in Ref. 3). These include 1) suboptimal maturation or functional capacity of HIV-1-specific CD8+ T cells (possibly due in part to destruction of HIV-1-specific CD4+ T cells and/or induction of defects in DC numbers or function), 2) viral strategies for resisting control by CTL effector mechanisms, and 3) viral strategies for evading recognition by the immune system, for example by inducing down-regulation of surface MHC class I expression on infected cells and evolving mutations that confer escape from ongoing CTL responses. The pressure exerted by the HIV-1-specific CD8 response in limiting HIV-1 replication forces selection for viral variants that can evade CD8+ T cell recognition and grow out as dominant quasispecies. Escape occurs commonly in HIV-1 infection (4, 5) (sometimes coinciding with the onset of disease progression; Refs. 6, 7, 8) and may be mediated by amino acid sequence variation in CD8+ T cell epitopes (or epitope-flanking regions) leading to impaired peptide processing (9, 10, 11), impaired peptide binding to the HLA class I molecule (7, 9) or alterations to the TCR contact surface of the epitope (12), all of which can result in reduced TCR recognition of the HLA:peptide complex. Restriction of HIV-1 replication may in part depend on the ability of the HIV-1-specific CD8 response to limit the outgrowth of escape variants. Escape may be minimized when the CD8 response is focused predominantly on epitopes located in structurally important regions of the virus (where acquisition of amino acid changes is associated with high costs to intrinsic viral fitness) (7, 13, 14), or where the response is more evenly directed toward multiple HIV-1 epitopes (so that the selective pressure for amino acid change in each individual epitope is reduced) (15, 16). Indeed, escape of other persistent viruses from CD8+ T cell recognition is seen where the response is directed toward a limited number of epitopes (17, 18) and rapid escape from narrowly directed vaccine-induced CD8+ T cell responses has been reported in SIV/simian HIV macaque models of infection (19, 20, 21). The breadth of TCR usage or properties of individual TCR(s) used for epitope recognition may also impact on the ease with which viral variants escape from these CD8 responses. Efficient recognition of HIV-1 epitope variants and a more favorable disease outcome has been shown to be conferred by polyclonal TCR usage or use of highly flexible individual TCRs (22, 23). Furthermore, HIV-1-infected individuals showing mono/oligoclonal T cell expansions during primary HIV-1 infection established higher persisting viral loads (24, 25) and epitope-specific responses dominated by fewer T cell clones have been associated with poorer restriction of viral replication (26). There is much evidence supporting associations between certain HLA class I alleles and the rate of progression to disease in HIV-1 infection (27, 28, 29, 30). Alleles including HLA-B57 (31, 32, 33, 34) and HLA-B27 (6, 35, 36, 37) are overrepresented in long-term nonprogressors (LTNPs)3 and are associated with better control of viral replication and delayed disease progression. Conversely, alleles such as HLA-B8 (36, 38), HLA-B3502/03/5301 (39, 40), and HLA-A29 (41) have been associated with poorer restriction of viral replication and more rapid disease progression. Similarly, associations have been reported between HLA class I type and rate of disease progression in HIV-2 infection (42) and between MHC class I type and disease progression in SIV-infected rhesus monkeys (28, 43). Interestingly, these associations are not absolute and a spectrum of disease profiles may be observed between individuals expressing a common HLA class I allele. The associations between HLA class I alleles and the rate of disease progression in HIV-1 infection may relate to the efficacy of CD8+ T cell responses primed in the context of these alleles and the ease with which HIV-1 can escape from immune control. By presenting immunodominant epitopes which are structurally conserved (44), presenting a broader array of HIV-1 epitopes (45), or by restricting responses that use a broad or functionally flexible T cell repertoire efficient in the recognition of variant epitope sequences, “good” HLA class I alleles may be associated with epitope-specific CD8 responses from which there is limited escape. We have addressed whether epitope-specific CD8+ T cell responses restricted by HLA class I alleles associated with good or poor prognosis of HIV-1 infection show differential ability to recognize point-mutated epitope variants (representing those that may arise in vivo through virus sequence variation). The epitope-specific CD8 responses found to exhibit the most efficient variant cross-recognition were those more strongly associated with delayed disease progression in HIV-1 infection. We also investigated whether differences in cross-recognition efficiency were related to the breadth of TCR usage. All epitope-specific responses we studied were mediated by a restricted repertoire of T cells, suggesting that differences in variant cross-reactivity and the potential to restrict the outgrowth of escape variants may be dictated by individual features of the dominant TCR(s) used for epitope recognition. Individuals chronically infected (>6 mo) with HIV-1 (clade B) were recruited from the Centre for Sexual Health and HIV Research (London, U.K.), from the Adult HIV Clinic of the University of Alabama at Birmingham (Birmingham, AL), and from the Adolescent Medicine Trials Network for HIV/AIDS Intervention (ATN) as part of protocol ATN 026. Ethical approval for these studies was obtained from local institutional review boards and blood samples were drawn with written informed consent. Patients were Caucasian (45 of 53) or African-American (8 of 53), were asymptomatic, and were not undergoing antiretroviral therapy at the time of sample acquisition. A summary of patient clinical characteristics is shown in Table I⇓. Blood was collected into acid citrate dextrose or EDTA. PBMC were separated by centrifugation over a Histopaque 1.077 density gradient (Sigma-Aldrich) and cryopreserved until use. DNA was isolated from patient PBMC using a QIAamp DNA Blood Mini kit (Qiagen). HLA class I fine typing was largely performed at the Churchill Hospital (Oxford, U.K.) using a molecular PCR method using sequence-specific primer mixes (PCR-SSP). RPMI 1640 medium with Glutamax and 25 mM HEPES (Invitrogen Life Technologies) supplemented with 10% FCS (Invitrogen Life Technologies), 100 U/ml penicillin, and 100 U/ml streptomycin (Sigma-Aldrich) is referred to as R10 throughout. CD3-FITC and a panel of FITC-conjugated and unconjugated anti-TCR Vβ mAbs (1, 2, 3, 5.1, 5.2, 5.3, 7, 8, 9, 11, 12, 13.1, 13.6, 14, 16, 17, 18, 20, 21.3, 22, and 23) were purchased from Serotec. TCR Vβ 6.7-FITC was obtained from Perbio Science and TCR Vβ 13.2 was a gift from Dr. T. Dong (University of Oxford, Oxford, U.K.). PerCP-conjugated CD3, allophycocyanin-conjugated CD8, PE-conjugated IFN-γ, and relevant isotype control mAbs were obtained from BD Biosciences. Synthetic peptides corresponding to clade B consensus epitope sequences or epitope variant sequences were synthesized by F-moc or TBoc chemistry and purchased as Pepsets in a peptide-amino acid format (Perbio Science) or were synthesized by the Institute for Animal Health Protein Chemistry Unit (Compton, U.K.). MultiScreen plates (MAHAS4510; Millipore) were coated overnight with 5 μg/ml anti-human IFN-γ capture Ab 1-D1-K (Mabtech). Plates were washed three times with R10 and blocked with R10 for 2 h at 37°C. A total of 2 × 105 PBMC/well was stimulated in duplicate for 24 h at 37°C with medium alone (negative control), 10 μg/ml PHA (Sigma-Aldrich) (positive control) or peptide (typically at 10−5 M). After washing three times with H2O and three times with PBS/0.05% Tween 20, plates were incubated with 1 μg/ml biotinylated anti-human IFN-γ detection Ab 7-B6-1 (Mabtech) in PBS/10%FCS overnight at 4°C. Plates were washed three times with PBS/Tween 20 before 1-h incubation at room temperature with a 1/100 dilution of avidin-HRP (BD Biosciences) in PBS/10% FCS. Following washing, HRP was developed with final concentrations of 333.3 μg/ml 3-amino-9-ethyl-carbazole in N, N-dimethylformamide (both Sigma-Aldrich) and 0.015% hydrogen peroxide (Sigma-Aldrich) in 0.1 M acetate buffer. Plates were air-dried and spots were enumerated using an AID image analysis system with AID ELISPOT software version 2.5 (Autoimmune Diagnostika). A positive response was defined as one where the average number of spot-forming cells was at least twice the background number in medium alone wells and >20 spots/106 PBMC. A total of 1–2 × 105 cells in 200 μl of R10 was stimulated for 6 h at 37°C with 10−5 M peptide in the presence of 0.7 μl/ml Golgi Stop (BD Biosciences). Cells cultured in medium alone or 50 ng/ml PMA + 500 ng/ml ionomycin (both Sigma-Aldrich) served as negative and positive controls for IFN-γ production, respectively. Following culture, cells were washed and immunolabeled with CD3-PerCP and CD8-allophycocyanin mAbs (and in some cases, TCR Vβ FITC mAbs), then fixed and permeabilized using 1× Cytofix/Cytoperm (BD Biosciences) and stained with IFN-γ-PE or a relevant isotype control mAb. Cells were washed three times with PBS/FCS and fixed in Cytofix (BD Biosciences). Samples were acquired on a FACSCalibur and analyzed using CellQuest Pro software (both BD Biosciences). Specific IFN-γ production in response to alanine-substituted epitope peptide variants was expressed as a percentage of the response observed to the clade B consensus sequence epitope peptide (100%). A patient’s functional cross-recognition score was defined as the sum of the responses seen to each of the alanine-substituted variants for a given epitope, divided by the total number of variants tested. Differences in the average functional cross-recognition efficiencies between different epitope-specific responses were tested using a general linear model of ANOVA using Tukey’s correction for multiple pairwise comparisons. In each patient, we also calculated the number of tested variant peptides which elicited a response of at least 50% of the magnitude of the response to the clade B consensus sequence peptide. Data from different patients were grouped according to epitope and we tested interepitopic differences in cross-recognition using a binary logistic regression model. HLA-B57+ individuals were grouped according to whether they exhibited more efficient or poorer cross-recognition of alanine-substituted variants of the HLA-B57 KAFSPEVIPMF epitope. Differences in the log10 plasma viral load titers between these two groups were tested using an unpaired two-sample “t” test. All statistical analyses were performed using MINITAB 14 software and independently reviewed by S. Leidi of the Statistical Services Centre, Section of Applied Statistics (University of Reading, Reading, U.K.). PE-conjugated HLA-A*0301 QVPLRPMTYK and HLA-A*0301 RLRPGGKKK tetramers were obtained from ProImmune. PE-conjugated HLA-B*5701 KAFSPEVIPMF, HLA-B*5701 QASQEVKNW, HLA-B*5701 ISPRTLNAW, HLA-B*5701 TSTLQEQIGW, HLA-B*0801 FLKEKGGL, HLA-B*0801 GEIYKRWII, and HLA-B*2705 KRWIILGLNK tetramers were obtained from Beckman Coulter. The specificity of tetramer staining was tested by comparing labeling of CD8+ T cells from HIV-1-infected individuals shown to have an epitope-specific response by ex vivo IFN-γ ELISPOT assay, with staining of CD8+ T cells from a HLA class I-matched HIV-1-negative donor. Tetramer staining was conducted for 20 min at 37°C in PBS/10% FCS. Cells were washed in excess PBS/10% FCS and blocked for 10 min at 4°C with 10% human AB serum (Sigma-Aldrich) before labeling for 15 min at 4°C with CD3-PerCP and CD8-allophycocyanin mAbs. Cells were washed and fixed in Cytofix. PBMC were resuspended in PBS/10% FCS and immunolabeled with the relevant tetramer, washed three times PBS/FCS and then either labeled with CD3-PerCP, CD8-allophycocyanin, and one of a panel of TCR Vβ-FITC mAbs for 15 min at 4°C, or labeled with unconjugated anti-TCR Vβ mAbs, detected using goat anti-mouse IgG Fab-FITC (Jackson ImmunoResearch Laboratories), blocked with 10% normal mouse serum (Sigma-Aldrich) in PBS/10%FCS and then labeled with CD3-PerCP and CD8-allophycocyanin mAbs. Cells were washed and fixed in Cytofix. Heteroduplex analysis was conducted using a modification of a previously described method (22). Flow-sorted tetramer+CD8+CD3+ T cells (typically 1–1.5 × 105 cells) and tetramer-depleted CD8+CD3+ T cells were lysed using 500 μl of Tri-Reagent (Sigma-Aldrich). RNA was isolated by chloroform/isopropanol extraction, quantified using the Ribogreen RNA quantitation reagent (Invitrogen Life Technologies), reverse-transcribed, and then cDNA was amplified using TCR Vβ family-specific primers (1, 2, 3, 4, 5.1, 5.2, 6, 7, 8, 9, 10, 11, 12, 13.1, 13.2, 14, 15, 16, 17, 18, 19, 20, 21, 22, 23, 24). PCR products were annealed to relevant TCR Vβ carrier DNAs and products were separated by acrylamide gel electrophoresis. Following transfer onto a nitrocellulose membrane and hybridization with digoxigenin-labeled carrier probe, products were detected using an alkaline phosphatase-conjugated anti-digoxigenin Fab Ab and visualized by chemiluminescence using CDP-Star substrate (both Roche Diagnostics). Predominant clones detected within tetramer+ populations were undetectable in the corresponding tetramer-depleted CD8+ T cell population, indicative of highly pure flow-sorted populations. To examine whether Ag-specific CD8+ T cell responses restricted by HLA class I alleles associated with differential disease prognosis varied in their capacity to cross-recognize HIV-1 epitope variants, we initially studied epitope-specific responses restricted by HLA-B57/HLA-B27 (very strongly associated with delayed progression to AIDS), HLA-B8 (associated with more rapid progression to AIDS) and as a control, HLA-A3 (no association with accelerated/delayed progression to AIDS). 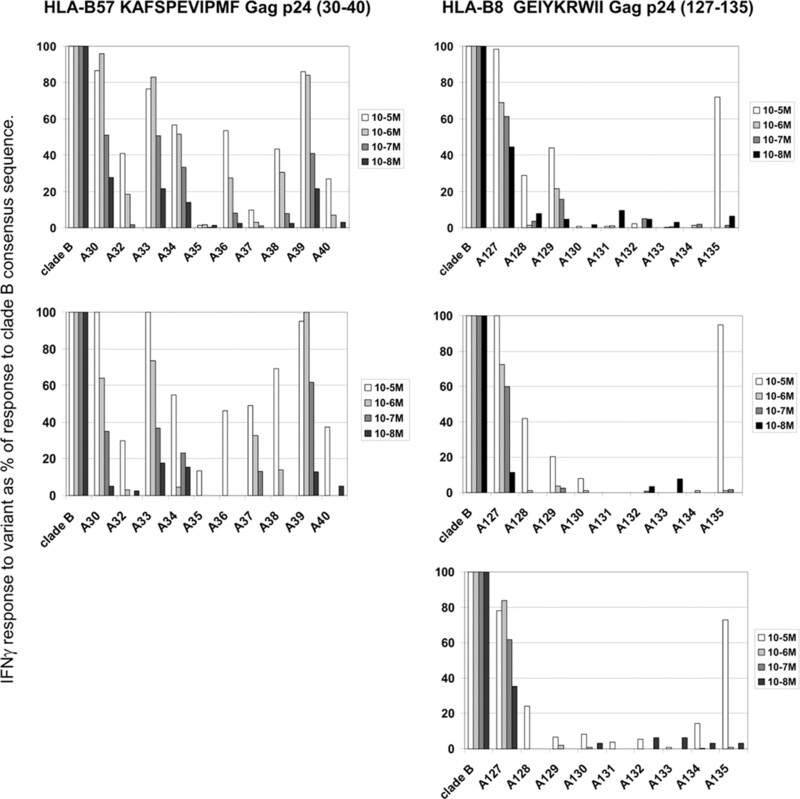 We studied two frequently targeted, immunodominant epitopes restricted by each molecule: HLA-B57 KAFSPEVIPMF Gag p2430–40 (B57-KAF), HLA-B57 ISPRTLNAW Gag p2415–23 (B57-ISP), HLA-B8 FLKEKGGL Nef90–97 (B8-FLK), HLA-B8 GEIYKRWII Gag p24127–135 (B8-GEI), HLA-A3 QVPLRPMTYK Nef73–82 (A3-QVP), and HLA-A3 RLRPGGKKK Gag p1720–28 (A3-RLR). Chronically infected individuals of an appropriate HLA class I type were screened for responses to clade B consensus sequence epitope peptides by tetramer immunolabeling and/or IFN-γ ELISPOT assay and patients showing readily detectable responses were studied further. We identified naturally occurring variants of the consensus sequence epitopes in the Los Alamos database and tested the ability of ex vivo CD8 responses in 5–15 patients/epitope to recognize variant peptides by IFN-γ ELISPOT assay. Natural variants of B57-KAF were very efficiently cross-recognized, with good responses to six of nine variants observed in most patients studied (Fig. 1⇓a). Cross-recognition was less efficient for variants of B57-ISP; although two of seven patients exhibited broadly cross-reactive responses, poor cross-reactivity was observed for the remaining subjects (five of seven) (Fig. 1⇓b). Cross-recognition was also less efficient for A3-QVP natural variants (Fig. 1⇓c), yet notably, there was a clear division between individuals either showing quite efficient or very poor cross-reactivity. We observed little/no recognition of the majority of natural A3-RLR variants in all patients tested (Fig. 1⇓d). Overall, ex vivo responses to natural variants of the B8-FLK epitope were quite weakly cross-reactive (Fig. 1⇓e). Furthermore, we observed little/no recognition of four of seven B8-GEI variants in all patients tested and high interpatient variability in cross-recognition efficiency for the remaining variants (Fig. 1⇓f). These initial data indicated that there is variation in the efficiency with which naturally occurring variants of different HIV-1 epitopes (including those presented by a common HLA class I allele) are recognized by HIV-1-specific CD8+ T cell responses. Cross-recognition of naturally occurring HIV-1 epitope variants by ex vivo epitope-specific CD8 responses. The ability of Ag-specific CD8+ T cells contained within patient PBMC to cross-recognize naturally occurring peptide variants of six different clade B consensus sequence HIV-1 epitopes (a–f) was tested in 5–14 patients/epitope. Specific IFN-γ production in response to peptide stimulation (10−5 M) was measured by IFN-γ ELISPOT assay and the response to each variant peptide was expressed as a proportion of the response to the clade B consensus sequence peptide (100%). Symbols represent responses observed to the indicated peptide in individual patients. Studying ex vivo responses toward documented naturally occurring HIV-1 epitope variants gives an indication of the efficiency with which some of the variants encountered during the natural course of infection may be recognized. However, amino acid substitutions in natural variants of some HIV-1 epitopes tend to be biased to a common position, whereas for other epitopes, the position(s) at which amino acid substitutions occur may be more variable. This creates difficulties when trying to fairly compare the cross-recognition efficiencies of responses between different epitopes. For this reason, we adopted an alternative approach for comparing the functional cross-recognition efficiencies of epitope-specific responses restricted by different HLA class I alleles. We examined recognition of alanine-scanning epitope variants (incorporating a single alanine substitution at consecutive amino acid positions in the clade B consensus sequence epitope). This approach ensured that a similar panel of variants would be tested for each epitope, allowing for a fairer interepitope comparison and statistical analysis of the data. The epitopes studied and their associations with disease progression are summarized in Table II⇓. We studied ex vivo functional cross-recognition of variants of four different HLA-B57-restricted HIV-1 epitopes: KAFSPEVIPMF Gag p2430–40 (B57-KAF), TSTLQEQIGW Gag p24108–117 (B57-TST), ISPRTLNAW Gag p2415–23, (B57-ISP), and QASQEVKNW Gag p24176–184 (B57-QAS), responses to which have been reported in HLA-B57+ LTNPs (31, 32, 33, 46, 47). Overall, B57-KAF-specific responses were efficient in recognizing alanine-substituted variants, although there was considerable interpatient variability in the patterns of cross-reactivity observed. Most variants were recognized to at least some degree in most patients and a number of the variants were recognized with similar efficiency to the clade B consensus sequence in multiple individuals (Fig. 2⇓a). B57-TST-specific responses also showed efficient recognition of a number of the alanine-substituted variants (Fig. 2⇓b), although the responses were not as broadly cross-reactive as seen for B57-KAF. In contrast to B57-KAF and B57-TST, considerably poorer variant cross-reactivity was seen for B57-ISP-specific and B57-QAS-specific responses whereby most alanine-substituted variants were recognized quite weakly, if at all, in the majority of patients (Fig. 2⇓, c and d). Cross-recognition of alanine-substituted HIV-1 epitope variants by ex vivo epitope-specific CD8 responses. The ability of Ag-specific CD8+ T cells contained within patient PBMC to cross-recognize alanine (A)-substituted variants of 10 different HIV-1 clade B consensus sequence epitopes (a–j) were studied in 3–17 individuals/epitope. Specific IFN-γ production in response to peptide stimulation (10−5 M) was measured by ELISPOT assay and the response to each variant peptide was expressed as proportion of the response to the clade B consensus sequence peptide (100%). Symbols represent responses observed to the indicated peptide in individual patients. The HLA-B27-restricted KRWIILGLNK Gag p24131–140 epitope (B27-KRW) is very strongly associated with delayed disease progression (6, 7, 47) and we found ex vivo KRW-specific responses to show highly efficient cross-recognition of alanine-substituted variants (Fig. 2⇑e), with 5–7 of the 10 variants being recognized to a good degree in each individual. 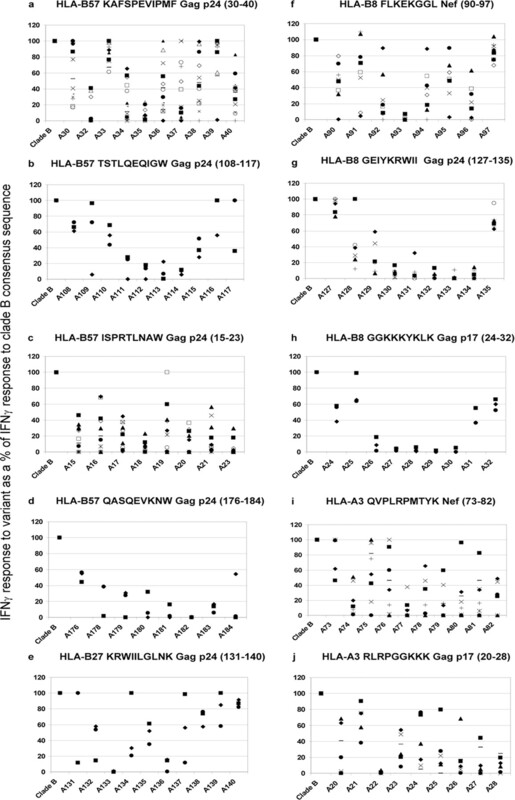 We studied responses to epitopes that are commonly targeted by HLA-B8+ patients: FLKEKGGL Nef90–97 (B8-FLK), GEIYKRWII Gag p24127–135 (B8-GEI), and GGKKKYKLK Gag p1724–32 (B8-GGK). In a small proportion of HIV-1-infected individuals, responses to B8-FLK have been linked with delayed progression to AIDS, whereas responses to B8-GEI and B8-GGK have not (23). The efficiency with which B8-FLK variants were recognized was variable between patients, however in the majority of individuals (five of eight), most variants were recognized to at least some degree (Fig. 2⇑f). In three of eight patients, cross-recognition was poorer and inconsistent in terms of the patterns of variant recognition observed. In contrast, B8-GEI and B8-GGK-specific responses proved to be very weakly cross-reactive, with little/no recognition of most alanine-substituted variants of both epitopes by Ag-specific CD8+ T cells (Fig. 2⇑, g and h). Ex vivo responses to alanine-substituted variants of the QVPLRPMTYK Nef73–82 (A3-QVP) and RLRPGGKKK Gag p1720–28 (A3-RLR) epitopes were studied. The patterns of A3-QVP variant cross-recognition were divided between individuals who showed either very efficient or very poor cross-reactivity toward most variants (Fig. 2⇑i). Cross-reactivity patterns between patients were more inconsistent for A3-RLR epitope variants (in terms of which variants were recognized and to what degree) but overall, cross-reactivity was relatively poor (Fig. 2⇑j). We wanted to examine whether the interepitope differences in CD8+ T cell functional cross-reactivity observed at high peptide concentrations (10−5 M) might be maintained or even more pronounced, at lower (perhaps more physiologically relevant) peptide concentrations. We therefore analyzed the effect of peptide titration on the ability of ex vivo CD8 responses to cross-recognize alanine-substituted variants of the B57-KAF and B8-GEI epitopes (showing very efficient and very poor cross-reactivity respectively at 10−5 M) by IFN-γ ELISPOT assay (Fig. 3⇓). For both epitopes, as expected, IFN-γ production in response to the clade B consensus sequence peptide was reduced in line with a reduction in peptide concentration (data not shown). Furthermore, fewer variants of both B57-KAF and B8-GEI were recognized as the peptide concentration was lowered and those that were recognized induced weaker IFN-γ production by the Ag-specific T cell population. For B57-KAF-specific responses, 8 of 10 alanine variants were recognized at >20% of the response to the clade B consensus sequence at 10−5 M peptide compared with only 4 of 10 at 10−8 M. For B8-GEI-specific responses, an average of 4 of 9 variants were recognized at >20% threshold at 10−5 M peptide compared with 1 of 9 recognized at 10−8 M. Thus, for both epitope-specific responses, the efficiency of variant cross-recognition was reduced at lower peptide concentrations, yet the interepitopic differences in variant cross-recognition efficiency were maintained, with a greater number of B57-KAF epitope variants being recognized compared with B8-GEI epitope variants at lower peptide concentrations. Interepitopic differences in variant cross-recognition efficiency are also evident at lower peptide concentrations. PBMC from two patients recognizing the HLA-B57 KAFSPEVIPMF epitope and three patients recognizing the HLA-B8 GEIYKRWII epitope were stimulated for 24 h with the clade B consensus sequence peptide sequence or a panel of alanine (A)-substituted peptide variants, each at concentrations of 10−5 M, 10−6 M, 10−7 M, and 10−8 M. The specific IFN-γ response to each variant peptide was expressed as a proportion of the response toward the clade B consensus sequence at the same peptide concentration. Each panel shows the cross-recognition pattern observed at a range of peptide concentrations in a single patient. For each patient studied, we calculated a functional cross-recognition score based on the responses to alanine-substituted epitope variants (Fig. 4⇓a). Scores from individual patients were pooled (Fig. 4⇓b) and the data was analyzed by ANOVA to test whether interepitopic differences in average variant cross-recognition were statistically significant. B57-KAF and B27-KRW-specific CD8 responses were found to be significantly more cross-reactive for alanine-substituted variants compared with responses to several other epitopes (B57-ISP, B57-QAS, B8-GEI, A3-RLR, (p < 0.05, Table III⇓). Although showing average cross-recognition scores comparable with responses to the B57-KAF and B27-KRW epitopes, B57-TST and B8-FLK-specific responses were only significantly more cross-reactive compared with B57-ISP and B57-QAS-specific responses (Table III⇓). Ex vivo HIV-1-specific CD8 responses vary in their ability to cross-recognize alanine-substituted epitope variants. a, Calculation of patient functional cross-recognition scores and the number of variants recognized above 50% of the magnitude of the response to the clade B consensus sequence. The ability of Ag-specific T cells to recognize variants of the HLA-B57 KAFSPEVIPMF epitope peptide bearing alanine (A) substitutions at the indicated residue numbers was analyzed by IFN-γ ELISPOT assay. Data from two patients (i and ii) is shown. The response to each variant peptide was expressed as a proportion of the response to the clade B consensus sequence (100%). A patient’s functional cross-recognition score was calculated by dividing the sum of the responses to the individual variants by the total number of variants tested. The dotted line shows the half maximal response to the clade B consensus sequence and the number of variant responses exceeding this half maximal threshold level is indicated. b, Ag-specific T cell recognition of the clade B consensus sequence and alanine-substituted variants of 10 different HIV-1 epitopes was analyzed in between 3 and 14 individuals/epitope. For each epitope, the functional cross-recognition score of the response in each patient studied was calculated as described in a. Symbols indicate individual patient’s cross-recognition scores for the indicated epitope and horizontal bars indicate the mean cross-recognition scores for each epitope. Together, these results indicate that HIV-1-specific CD8 responses (including those restricted by a common HLA class I allele) exhibit variable efficiency in recognizing alanine-substituted epitope variants. Importantly, the CD8 responses showing the most efficient cross-reactivity toward alanine-substituted variants were specific for epitopes that are very strongly associated with long-term nonprogression (B57-KAF and B27-KRW). That B8-FLK and B57-TST-specific responses also showed a trend toward more efficient functional cross-recognition may relate to observations that these epitopes are linked with delayed disease progression in a minor subset of HLA-B57+ and HLA-B8+ HIV-1-infected individuals, respectively. We wondered whether interepitopic differences in variant cross-recognition efficiency might reflect differences in the relative breadth of TCR(s) used for epitope recognition. We therefore analyzed TCR Vβ expression by tetramer+CD8+ T cells by flow cytometry. For all clade B consensus sequence epitopes studied and independent of the restricting HLA class I allele, epitope-specific CD8+ T cells in most chronically infected individuals (n > 25) exhibited narrowly focused TCR Vβ family usage (examples shown in Fig. 5⇓a). In some patients we could account for only a small percentage of the total TCR Vβ family usage by tetramer+CD8+ T cells, probably because our panel of Vβ mAbs was incomplete (mAbs for 19 of 25 families). However, it is likely that the TCR Vβ usage in these cases was also highly focused, given that most of the response was unaccounted for using mAbs specific for 75% of Vβ families. There was no significant difference in the average minimum number of Vβ families used by tetramer+CD8+ T cells of different specificities (Fig. 5⇓b). HIV-specific CD8+ T cells show highly focused TCR Vβ family usage. a, Patient PBMC were immunolabeled with tetramer, anti-CD3, anti-CD8, and one of a panel of TCR Vβ family mAbs. The proportion of tetramer+CD3+CD8+ T cells expressing TCRs in each Vβ family was determined. Examples of TCR Vβ family usage by tetramer+CD8+ T cells of three different epitope specificities in three patients each are shown. b, The minimum number of TCR Vβ families expressed by tetramer+CD8+ T cells in each patient was calculated by determining the number of TCR Vβ family-specific mAbs that stained tetramer+ cells above a 5% threshold. In patients where total Vβ usage was <100%, one was added to account for use of at least one other family for which mAbs were unavailable. The average minimum number of TCR Vβ families used by different patients in the recognition of each epitope studied is shown. Error bars represent SD from the mean. c–e, Data from three HIV-1-infected patients is shown (c, MM13; d, MM3; and e, CP40). In each, (i) shows the ex vivo functional cross-recognition of alanine (A)-substituted epitope variants by Ag-specific CD8+ T cells within total PBMC as measured by IFN-γ ELISPOT assay. IFN-γ production in response to each individual epitope variant peptide is expressed as a percentage of the response observed to the clade B consensus sequence peptide (100%). ii, TCR Vβ family usage by ex vivo tetramer+CD8+ T cells. Patient PBMC were stained with a relevant tetramer (corresponding to the relevant HLA class I molecule and clade B consensus sequence epitope), anti-CD3, anti-CD8 and a panel of TCR Vβ family Abs. The percentage of tetramer+CD3+CD8+ T cells expressing TCRs in each Vβ family was determined. iii, IFN-γ production by Ag-specific CD8+ T cells in response to short-term in vitro peptide stimulation, as measured by intracellular cytokine staining (ICS). Patient PBMC were cultured with peptide corresponding to the clade B consensus sequence epitope peptide or the three most efficiently recognized alanine (A)-substituted epitope variants (as indicated in i). The frequency of CD3+CD8+ T cells producing IFN-γ in response to each variant peptide was determined and expressed as a percentage of the IFN-γ response observed to the clade B consensus sequence peptide (100%). iv, The TCR Vβ family found in ii to be used by the majority of tetramer+CD8+ T cells was also expressed by IFN-γ-producing CD3+CD8+ T cells after short-term in vitro stimulation with peptides corresponding to the relevant clade B consensus sequence epitope or the most efficiently recognized alanine (A)-substituted variant epitope peptides (as indicated in i). Dot plot percentages refer to the frequency of IFN-γ+CD8+CD3+ T cells not expressing (upper left quadrant) and expressing (upper right quadrant) the relevant TCR Vβ family. We went on to determine whether the same population of tetramer+CD8+ T cells showing biased TCR Vβ usage was in fact mediating the IFN-γ production seen in response to stimulation with the different alanine-substituted epitope variants. In six patients, we found that CD8+ T cells producing IFN-γ in response to short-term stimulation with peptides corresponding to the clade B consensus sequence epitope (A3-QVP, B8-GEI, B8-FLK, B57-KAF) or their most efficiently recognized alanine-substituted variants, expressed the same predominant TCR Vβ family (Fig. 5⇑, c–e). This demonstrates that the biased TCR usage we observed for different epitope-specific responses was not an artifact of the method used to identify the Ag-specific population, and suggests that variants are recognized by a dominating cross-reactive CD8 population specific for the consensus sequence, rather than by multiple individual populations each specific for a different variant. Although tetramer+CD8+ T cells showed restricted TCR Vβ family usage (suggestive of limited clonal breadth), it remained possible that multiple T cell clones might exist within any one TCR Vβ family and that interepitope differences in variant cross-recognition efficiency may be explained by differences in the clonal breadth of different epitope-specific responses. We therefore flow-sorted and performed heteroduplex analysis on tetramer+CD8+ T cells from one patient showing efficient cross-reactivity for variants of the B27-KRW epitope and two patients showing less efficient functional cross-recognition of variants of the B8-FLK epitope. In each patient, within the dominant TCR Vβ family (identified by mAb labeling), we detected very few expanded T cell clones (Fig. 6⇓). This suggests that epitope-specific CD8 responses in chronic HIV-1 infection, irrespective of variant cross-recognition efficiency, may be oligoclonal rather than polyclonal. HIV-1-specific CD8+ T cells show limited clonal breadth. Heteroduplex analysis was performed on flow-sorted tetramer+CD3+CD8+ T cells specific for the HLA-B27 KRWIILGLNK epitope (1 patient, a) or HLA-B8 FLKEKGGL epitope (two patients, b and c). Within the dominant TCR Vβ families used for epitope recognition (circled), we detected one to three clonal expansions. For some epitope-specific responses, we noted that patients could be subdivided according to their variant cross-recognition patterns. A3-QVP-specific responses in some HLA-A3+ patients were very cross-reactive for alanine-substituted variants, yet others showed extremely poor cross-recognition. Poor cross-recognition of alanine-substituted variants (and also naturally occurring variants, data not shown) in these patients was associated with an almost complete bias to TCR Vβ 13.6 usage (Fig. 7⇓a). More efficient variant cross-recognition was seen in patients whose response was not biased to this TCR. Similarly, for B57-KAF-specific responses, less efficient variant cross-reactivity was seen in individuals whose CD8+ T cells predominantly used TCR Vβ 17 (Fig. 7⇓b). These data suggest that variant cross-recognition efficiency is intimately linked to the dominant TCR(s) used for epitope recognition. Furthermore, for some epitopes, interpatient differences in cross-recognition efficiency and TCR usage may correlate with the efficiency of containment of viral replication. We found that more efficient cross-recognition of alanine-substituted B57-KAF variants and lack of TCR Vβ 17 usage by KAF-specific CD8+ T cells was associated with significantly lower viral loads at sampling as compared with individuals whose KAF-specific CD8 responses showed poorer variant cross-reactivity and were biased to TCR Vβ 17 usage (p = 0.014, Fig. 7⇓c). The association between plasma viral load and the efficiency of variant cross-recognition may however only hold true for epitope-specific responses that play a particularly key role in long-term control of HIV-1 replication. Relationship between functional cross-recognition efficiency and TCR Vβ family usage. a and b, TCR Vβ family usage by tetramer+CD8+ T cells and the corresponding pattern of variant cross-recognition are shown for representative patients responding to the HLA-A3 QVPLRPMTYK epitope (a) and the HLA-B57 KAFSPEVIPMF epitope (b). Patients whose tetramer+CD8+ T cells predominantly used TCR(s) in Vβ family 13.6 (A3-QVP) or Vβ 17 (B57-KAF) showed poorer functional cross-recognition of alanine (A)-substituted epitope variants compared with individuals not using these TCRs. c, The efficiency of cross-recognition of alanine (A)-substituted variants of the B57-KAFSPEVIPMF epitope was scored in HLA-B57+ individuals and patients were divided into “weaker cross-recognition” (n = 10) or “stronger cross-recognition” (n = 8) groups based on whether their scores fell below or above the mean cross-recognition score calculated for the entire group of HLA-B57 patients (<45 or >45, respectively, see Fig. 4⇑b). Plasma viral load titers from individuals in each group were compared. Symbols represent log10viral load titers in individual patients and horizontal bars indicate mean log10viral loads for each group. The statistical significance of the difference between the viral loads of the two groups (as assessed using an unpaired, two-sample Student’s t test) is shown. Increasing evidence indicates that viral escape from epitope-specific CD8+ T cell responses occurs frequently in HIV-1 infection and may be among the mechanisms by which HIV-1 evades CD8+ T cell control (47). Viral sequence variation may lead to escape from T cell responses by impairing epitope processing (9, 10, 11), impairing epitope binding to the restricting HLA class I molecule (7, 9) and/or directly impairing recognition of the HLA:peptide complex by Ag-specific T cells (12). Where the favored mechanism of escape is via direct effects on TCR recognition, escape may be limited in the presence of a functionally cross-reactive response. Efficient recognition of variant viral epitopes may contribute to continued control of virus replication. We initially hypothesized that epitope-specific T cell responses restricted by HLA class I alleles associated with delayed disease progression may show a better cross-recognition of epitope variants as compared with alleles associated with normal or accelerated disease progression. To address this, we measured cross-recognition of naturally occurring and alanine-substituted variants of selected immunodominant epitopes restricted by HLA-B57/-B27, HLA-A3 or HLA-B8. We found differences in cross-recognition efficiency between the epitopes tested and importantly, noted variability between epitopes restricted by the same HLA class I allele. The epitope-specific responses showing the most efficient variant cross-recognition (B57-KAF and B27-KRW) are very strongly associated with delayed progression to disease in HIV-1 infection (6, 7, 33). One of the factors contributing to this may be that these responses are useful in limiting the emergence of viral variants bearing potential escape mutations, thus restricting viral replication for longer and contributing to a longer disease-free interval. There is evidence to support this hypothesis. B57-KAF-specific CD8 responses are maintained for long periods in HLA-B57+ individuals (9, 47) and the sequence variants of this epitope that have been reported (33, 46) are recognized efficiently by KAF-specific responses in slow-progressing B57+ individuals (33). Similarly, escape from B27-KRW-specific responses typically occurs only after many years (6, 7). These associations with delayed disease progression have been largely attributed to structural constraints on viral sequence variation in the regions of Gag where these epitopes are located (7, 33). Our results suggest that efficient functional cross-recognition of sequence variants by these epitope-specific responses may restrict their escape further by limiting the potential for the virus to escape via avoidance of TCR recognition of the HLA:peptide complex. It is of note that late escape from B27-KRW-specific responses is typically achieved through mutations that abrogate peptide binding to HLA-B27 (7). Similarly, nonsynonymous mutations in B57-KAF tend to occur at the position 2 primary anchor residue (33, 46, 48, 49). Such mutations can affect peptide binding to the HLA-B57 molecule and may facilitate virus escape from KAF-specific CD8 responses (48). These data are consistent with there being limited options for the virus to escape via mutations that alter the TCR contact surface in the presence of functionally cross-reactive epitope-specific T cell clones. Although the variant cross-recognition capacity of B57-TST-specific responses was less efficient than observed for B57-KAF and B27-KRW-specific responses, B57-TST-specific responses in n = 3 chronically infected patients nevertheless showed a trend toward efficient variant cross-recognition and two of three patients showed very good restriction of viral replication (<500 RNA copies/ml plasma) at sampling (58 and 102 mo postdiagnosis). B57-TST responses are typically escaped during acute infection in the majority of B57+ infected individuals via mutations that alter the TCR contact surface of the peptide and abrogate T cell recognition (12), however TST-specific responses that are preserved in chronic infection are associated with slower disease progression (12, 46, 47). It is possible that TST-specific responses in most B57+ individuals may be insufficiently cross-reactive to limit escape from this epitope. Furthermore, B8-FLK-specific responses also showed a trend toward more efficient functional cross-recognition of alanine substitutions across the entire epitope, suggesting that in some patients, the TCR repertoire may be reasonably flexible. However, that cross-recognition of naturally occurring FLK variants was relatively weak in most patients tested may explain why escape from FLK-specific responses is often observed during early HIV-1 infection (50). Only a minority of infected individuals may possess an appropriately flexible TCR repertoire able to confer broad recognition of B8-FLK variants, delaying escape and contributing to a longer disease-free interval (23). We were intrigued to find that epitope-specific responses restricted by a common allele (particularly HLA-B57) did not necessarily show similar functional cross-recognition efficiency. The efficient cross-reactivity seen for B57-KAF and B57-TST-specific responses did not extend to B57-ISP and B57-QAS-specific responses. Given that responses to all four epitopes have been reported in LTNPs, it might be predicted that all would exhibit efficient cross-reactivity. However, the mere presence of an epitope-specific response in individuals exhibiting slow disease progression does not automatically prove that this response is central to restricting viral replication. We suggest that epitope-specific responses are not all equally efficacious and long-term nonprogression may result from appropriately directed responses to certain “critical” epitopes which are particularly useful in impeding viral escape. The idea that functionally flexible epitope-specific responses are less likely to be escaped via direct effects on T cell recognition implies that mutations that confer escape by altering amino acid residues important for T cell recognition might be more frequently observed within epitopes that are associated with poorer functional cross-reactivity. This is certainly true for several epitopes we have studied here. Naturally occurring mutations within viral genetic sequences encoding the B8-GGK, B8-GEI, and B57-QAS epitopes detected in patients of the appropriate HLA type have been shown to abrogate T cell recognition directly, or antagonize T cells specific for the wild-type sequence (46, 51, 52, 53). However, this association is not absolute, because both A3-RLR and B8-FLK-specific responses can be escaped via amino acid changes that lead to reduced/abrogated binding to the relevant HLA class I molecule (9, 50) and B57-ISP responses are commonly escaped via mutations that interfere with normal epitope processing (10). We had initially hypothesized that functional cross-recognition efficiency might correlate with the breadth of TCR usage. Instead, we found CD8+ T cells of varying HIV-1 epitope specificity and functional cross-recognition capacity to exhibit limited TCR Vβ family usage (suggestive of a highly restricted response) and for epitope-specific responses that we analyzed at the clonal level, we found the responses to be very focused. These data are consistent with other studies showing clonal biasing of CD8+ T cell responses in HIV-1 infection (22, 24, 25, 26, 54). Furthermore, even in cases where CD8 responses appear polyclonal at the TCR CDR3 sequence level, selection of TCRs sharing highly conserved motifs might result in a functionally mono/oligoclonal response (55). Biased TCR usage by epitope-specific CD8+ T cells has also been described in other viral infections (56, 57, 58) and may reflect selection over time for the most appropriate TCR(s) for epitope recognition (population “avidity maturation” in the presence of persistent antigenic stimulation (59)). One might therefore assume that all individuals responding to the same epitope would select the same TCR(s); however our results show that this is not the case. Factors influencing TCR selection may include the availability of CD4+ T cell help at the time the response is primed, previous pathogen exposure (60), or the efficiency of epitope presentation (61). Alternatively, our findings might reflect interpatient variability in infection duration and the ongoing dynamics of the TCR repertoire selection process. Deletion of exhausted, dominant clone(s) may make way for the expansion of clones bearing alternative TCR(s) of the same epitope specificity (62), but with a potentially different capacity for the recognition of epitope variants and limiting escape. Nevertheless, expanded epitope-specific CD8+ T cell clones have been shown to persist during chronic HIV-1 infection (22, 54). If HIV-1-specific CD8 responses are typically all highly focused, what might underlie the observed differences in functional cross-reactivity? The particular TCR(s) selected for epitope recognition are likely to be of paramount importance. B57-KAF and A3-QVP cross-reactivity patterns were of particular interest because there was a clear division between patients showing very good and very poor variant cross-recognition. These interpatient differences correlated well with the dominant TCR Vβ family used for epitope recognition, implying that the TCR repertoire may be critical in dictating how well viral variants may be recognized and how well escape from epitope-specific responses is restricted. Indeed, a recent study highlights how TCR usage can influence disease course in HIV-1 infection. HLA-B8+ individuals whose FLK-specific CD8+ T cells predominantly expressed TCR Vβ 13.2 (which has an unusually long, flexible CDR3 region), showed efficient recognition of natural variants of the FLK epitope and progressed significantly more slowly to AIDS compared with individuals whose FLK-specific response was biased toward other TCR Vβ families (23). Furthermore, our results for B57-KAF-specific responses suggest that poorer variant cross-recognition efficiency in chronic infection is associated with a bias to TCR Vβ 17 usage, higher plasma viral load titers and potentially a poorer disease prognosis. If maintenance of control of HIV-1 replication is influenced by the ability of CD8+ T cell responses to limit escape, it follows that escape should be detected more frequently in individuals who restrict virus replication less efficiently and progress more rapidly to disease. This might however only be true of epitope-specific responses that are particularly useful for restriction of virus replication. In this study, we demonstrated that patients showing more efficient cross-recognition of B57-KAF epitope variants had lower viral loads, and we have suggested that efficient functional flexibility might help to limit escape from KAF-specific CD8+ T cell responses. This may represent one mechanism underlying the associations of KAF-specific responses with long-term nonprogression. It follows that patients showing less efficient functional cross-recognition may exhibit a greater frequency of escape mutations in KAF and as a consequence, higher viral load. The frequency of escape mutations in the B57-KAF epitope in the patients studied here was not determined; however other data in the literature lend support to this hypothesis. Sequence variation in B57-KAF seems to be observed less frequently than variation in other HIV-1 epitopes, but it has been documented by several groups (33, 48, 49, 63). Whether escape from KAF-specific CD8+ T cell responses is related to the loss of control of viral replication and/or disease progression in HLA-B57+-infected individuals is somewhat controversial. Migueles et al. (46) found little sequence variation within the KAF epitope in both slow-progressing and rapidly progressing HLA-B5701+ individuals, arguing against a critical role for KAF escape in disease progression. More recently, however, KAF escape mutations have been described at high frequency (33, 48, 49), and in association with a higher viral load (P. Goulder, unpublished observation), in HLA-B57+ infected African subjects. It is possible that because HLA-B57+ individuals tend to mount responses to several B57-restricted epitopes (46, 47), the influence of escape from KAF-specific CD8 responses on restriction on HIV-1 replication may be more difficult to demonstrate as compared with other epitope-specific responses that are highly immunodominant within the context of their restricting HLA class I allele. A good example of the latter is the HLA-B27-restricted KRWIILGLNK epitope, to which the HIV-1-specific CD8 response in most HLA-B27+ infected individuals is biased (6, 7, 8). Plasma virus isolates from HLA-B27+ individuals tend to show a consistent pattern of amino acid substitutions within KRW, the appearance of which is closely associated with the onset of disease progression (6, 8). The conflicting data on the relevance of escape from epitope-specific CD8 responses for control of virus replication highlight that the outcome of HIV-1 infection is most likely multifactorial and that no one mechanism is solely responsible for dictating the rate of disease progression (15). Indeed, differences in other qualitative aspects of these and/or additional ongoing epitope-specific CD8 responses (such as the breadth, magnitude and kinetics of the response, characteristics of the responding T cell repertoire, functional capacity of virus-specific CD8+ T cells), as well as differences in the efficacy of other immune effector mechanisms may contribute to variation in disease course, particularly between individuals sharing a common HLA class I allele. So why are some HLA class I alleles more favorable to have than others in HIV-1 infection? We propose that one explanation may be that certain alleles (e.g., HLA-B57/27) are associated with more favorable disease prognosis because a higher proportion of infected individuals are able to generate functionally flexible responses toward certain critical immunodominant epitopes within which variation may already be limited due to high costs to viral fitness. 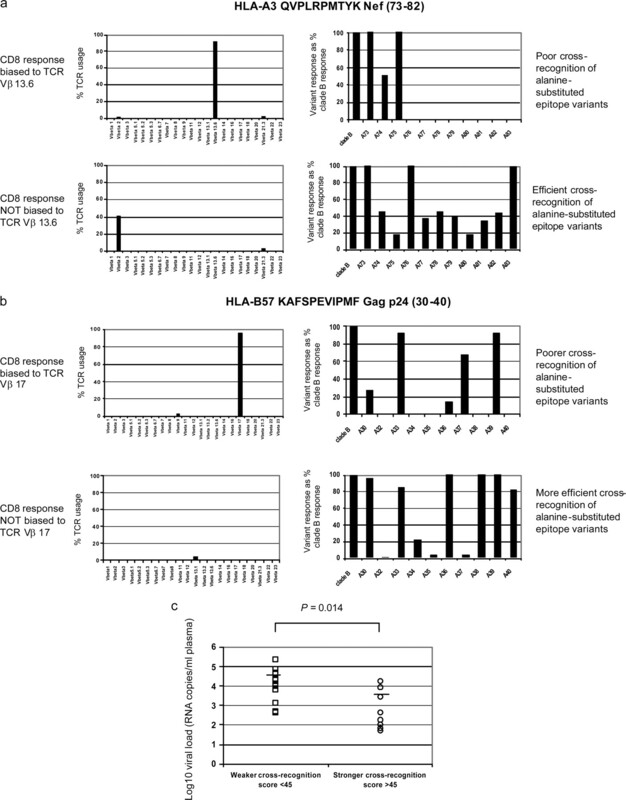 For alleles associated with poorer prognosis of infection (e.g., HLA-B8), it is conceivable that the majority of individuals fail to generate functionally cross-reactive responses to a number of immunodominant epitopes and that this contributes to an inability to restrict the outgrowth of variants able to evade CD8+ T cell recognition, leading to escape. Our data support the need for a greater understanding of the individual TCR(s) that are useful for cross-recognizing variants and limiting escape, and for understanding how selection of useful TCR(s) may be promoted in vivo. Vaccine-induced CD8+ T cell responses may only be optimally effective for long-term control of HIV-1 replication whether an appropriately flexible TCR repertoire is selected. We are extremely grateful to the patients who provided samples for study. We thank A. Worth for cell sorting, A. Bennett, and C. de Lara for assistance with the heteroduplex mobility assay, H. Stephens for HLA class I fine typing, S. Leidi for statistical advice and the staff at various Adolescent Trials Network sites for their participation in this study. We also thank P. Goulder for useful discussions of the data. This is manuscript number 108 from the Edward Jenner Institute. ↵1 This work was supported by National Institutes of Health (NIH) Grant Numbers AI 41530 (to P.B.) and AI49126 (to P.A.G. ), by the Global Health Program of the Bill and Melinda Gates Foundation Grant Number 37874, and by core funding from The Edward Jenner Institute. The various Adolescent Trials Network centres participating in the collection of samples for this study were funded by NIH Grant U01 HD40533. ↵3 Abbreviation used in this paper: LTNP, long-term nonprogressor. Schmitz, J. E., M. J. Kuroda, S. Santra, V. G. Sassaville, M. A. Simon, M. A. Lifton, P. Racz, K. Tenner-Racz, M. Dalesandro, B. J. Scallon, et al 1999. Control of viremia in simian immunodeficiency virus infection by CD8+ lymphocytes. Science 283: 857-860. Turnbull, E., P. Borrow. 2005. The immune response to human immunodeficiency virus type 1 (HIV-1). P. Digard, and A. A. Nash, and R. E. Randall, eds. Molecular Pathogenesis of Virus Infections 23-89. Cambridge University Press, Cambridge. Goulder, P., D. Price, M. Nowak, S. Rowland-Jones, R. Phillips, A. McMichael. 1997. Co-evolution of human immunodeficiency virus and cytotoxic T-lymphocyte responses. Immunol. Rev. 159: 17-29. Moore, C. B., M. John, I. R. James, F. T. Christiansen, C. S. Witt, S. A. Mallal. 2002. Evidence of HIV-1 adaptation to HLA-restricted immune responses at a population level. Science 296: 1439-1443. Goulder, P. J. R., R. E. Phillips, R. A. Colbert, S. McAdam, G. Ogg, M. A. Nowak, P. Giangrande, G. Luzzi, B. Morgan, A. Edwards, et al 1997. Late escape from an immunodominant cytotoxic T-lymphocyte response associated with progression to AIDS. Nat. Med. 3: 212-217. Kelleher, A. D., C. Long, E. C. Holmes, R. L. Allen, J. Wilson, C. Conlon, C. Workman, S. Shaunak, K. Olson, P. Goulder, et al 2001. Clustered mutations in HIV-1 gag are consistently required for escape from HLA-B27-restricted cytotoxic T lymphocyte responses. J. Exp. Med. 193: 375-386. Feeney, M. E., Y. Tang, K. A. Roosevelt, A. J. Leslie, K. McIntosh, N. Karthas, B. D. Walker, P. J. Goulder. 2004. Immune escape precedes breakthrough human immunodeficiency virus type 1 viremia and broadening of the cytotoxic T-lymphocyte response in an HLA-B27-positive long-term-nonprogressing child. J. Virol. 78: 8927-8930. Allen, T. M., M. Altfeld, X. G. Yu, K. M. O’Sullivan, M. Lichterfeld, S. Le Gall, M. John, B. R. Mothe, P. K. Lee, E. T. Kalife, et al 2004. Selection, transmission, and reversion of an antigen-processing cytotoxic T-lymphocyte escape mutation in human immunodeficiency virus type 1 infection. J. Virol. 78: 7069-7078. Draenert, R., S. Le Gall, K. J. Pfafferott, A. J. Leslie, P. Chetty, C. Brander, E. C. Holmes, S. C. Chang, M. E. Feeney, M. M. Addo, et al 2004. Immune selection for altered antigen processing leads to cytotoxic T lymphocyte escape in chronic HIV-1 infection. J. Exp. Med. 199: 905-915. Yokomaku, Y., H. Miura, H. Tomiyama, A. Kawana-Tachikawa, M. Tagikuchi, A. Kojima, Y. Nagai, A. Iwamoto, Z. Matsuda, K. Ariyoshi. 2004. Impaired processing and presentation of cytotoxic T lymphocyte (CTL) epitopes are major escape mechanisms from CTL immune pressure in human immunodeficiency virus type 1 infection. J. Virol. 78: 1324-1332. Leslie, A. J., K. J. Pfafferott, P. Chetty, R. Draenert, M. M. Addo, M. Feeney, Y. Tang, E. C. Holmes, T. Allen, J. G. Prado, et al 2004. HIV evolution: CTL escape mutation and reversion after transmission. Nat. Med. 10: 282-289. Goulder, P. J., A. Edwards, R. E. Phillips, A. J. McMichael. 1997. Identification of a novel HLA-B*2705-restricted cytotoxic T-lymphocyte epitope within a conserved region of HIV-1 Nef. AIDS 11: 536-538. Wagner, R., B. Leschonsky, E. Harrer, C. Paulus, C. Weber, B. D. Walker, S. Buchbinder, H. Wolf, J. R. Kalden, T. Harrer. 1999. Molecular and functional analysis of a conserved CTL epitope in HIV-1 p24 recognized from a long-term nonprogressor: constraints on immune escape associated with targeting a sequence essential for viral replication. J. Immunol. 162: 3727-3734. Geels, M. J., M. Cornelissen, H. Schuitemaker, K. Anderson, D. Kwa, J. Maas, J. T. Dekker, E. Baan, F. Zorgdrager, R. van den Burg, et al 2003. Identification of sequential viral escape mutants associated with altered T cell responses in a human immunodeficiency virus type 1-infected individual. J. Virol. 77: 12430-12440. Jones, N. A., X. Wei, D. R. Flower, M. Wong, F. Michor, M. S. Saag, B. H. Hahn, M. A. Nowak, G. M. Shaw, P. Borrow. 2004. Determinants of HIV-1 escape from the primary CD8+ cytotoxic T lymphocyte response. J. Exp. Med. 200: 1243-1256. Pircher, H., D. Moskophidis, U. Rohrer, K. Burki, H. Hengartner, R. M. Zinkernagel. 1990. Viral escape by selection of cytotoxic T cell-resistant virus variants in vivo. Nature 346: 629-633. Weidt, G., W. Deppert, O. Utermohlen, J. Heukeshoven, F. Lehmann-Grube. 1995. Emergence of virus escape mutants after immunization with epitope vaccine. J. Virol. 69: 7147-7151. Mortara, L., F. Letourneur, H. Gras-Masse, A. Venet, J.-G. Guillet, I. Bourgault-Villada. 1998. Selection of virus variants and emergence of virus escape mutants after immunization with an epitope vaccine. J. Virol. 72: 1403-1410. Barouch, D. H., J. Kunstman, M. J. Kuroda, J. E. Schmitz, S. Santra, F. W. Peyerl, G. R. Krivulka, K. Beaudry, M. A. Lifton, D. A. Gorgone, et al 2002. Eventual AIDS vaccine failure in a rhesus monkey by viral escape from cytotoxic T lymphocytes. Nature 415: 335-339. O’Connor, D. H., T. M. Allen, T. U. Vogel, P. Jing, I. P. DeSouza, E. L. Dodds, E. J. Dunphy, C. Melsaether, B. Mothe, H. Yamamoto, et al 2002. Acute phase cytotoxic T lymphocyte escape is a hallmark of simian immunodeficiency virus infection. Nat. Med. 8: 493-499. Lopes, A. R., A. Jaye, L. Dorrell, S. Sebally, A. Alabi, N. A. Jones, D. R. Flower, A. De Groot, P. Newton, M. Lascar, et al 2003. Greater T cell receptor heterogeneity and functional flexibility in human immunodeficiency virus type 2 (HIV-2) compared to HIV-1 infection. J. Immunol. 171: 307-316. Dong, T., G. Stewart-Jones, N. Chen, P. Easterbrook, X. Xu, L. Papagno, V. Appay, M. Weekes, C. Conlon, C. Spina, et al 2004. HIV-specific cytotoxic T cells from long-term survivors select a unique T cell receptor. J. Exp. Med. 200: 1547-1557. Pantaleo, G., J. F. Demarest, H. Soudeyns, C. Graziosi, F. Denis, J. W. Adelsberger, P. Borrow, M. S. Saag, G. M. Shaw, R. P. Sekaly, A. S. Fauci. 1994. Major expansion of CD8+ T cells with a predominant Vb usage during the primary immune response to HIV. Nature 370: 463-467. Pantaleo, G., J. F. Demarest, T. Schacker, M. Vaccarezza, O. J. Cohen, M. Daucher, C. Graziosi, S. S. Schnittman, T. C. Quinn, G. M. Shaw, et al 1997. The qualitative nature of the primary immune response to HIV infection is a prognosticator of disease progression independent of the initial level of plasma viremia. Proc. Natl. Acad. Sci. USA 94: 254-258. Kalams, S. A., R. P. Johnson, A. K. Trocha, M. J. Dynan, S. Ngo, R. T. D’Aquila, J. T. Kurnick, B. D. Walker. 1994. Longitudinal analysis of T cell receptor (TCR) gene usage by human immunodeficiency virus 1 envelope-specific cytotoxic T lymphocyte clones reveals a limited TCR repertoire. J. Exp. Med. 179: 1261-1271. Roger, M.. 1998. Influence of host genes on HIV-1 disease progression. FASEB J. 12: 625-632. Carrington, M., R. E. Bontrop. 2002. Effects of MHC class I on HIV/SIV disease in primates. AIDS 16: (Suppl. 4):S105-S114. Carrington, M., S. J. O’Brien. 2003. The influence of HLA genotype on AIDS. Annu. Rev. Med. 54: 535-551. Stephens, H. A.. 2005. 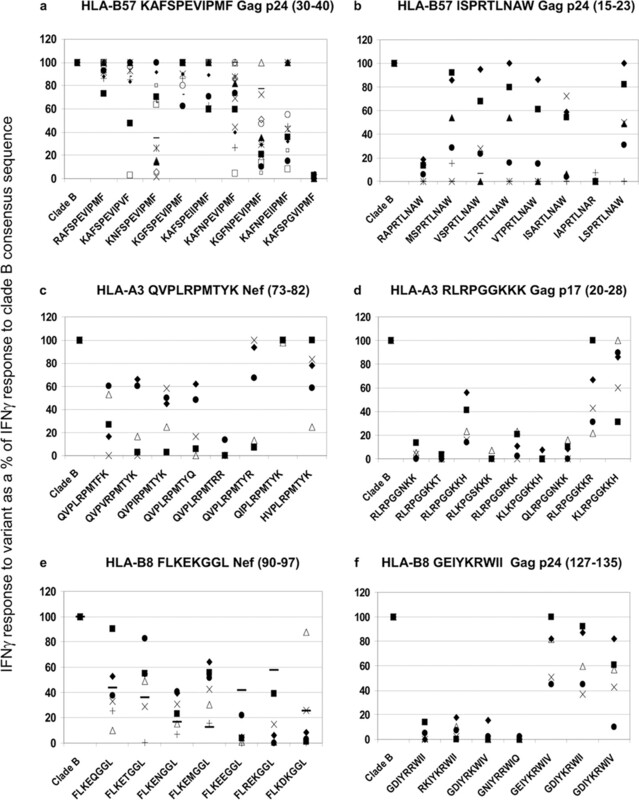 HIV-1 diversity versus HLA class I polymorphism. Trends Immunol. 26: 41-47. Goulder, P. J., M. Bunce, P. Krausa, K. McIntyre, S. Crowley, B. Morgan, A. Edwards, P. Giangrande, R. E. Phillips, A. J. McMichael. 1996. Novel, cross-restricted, conserved, and immunodominant cytotoxic T lymphocyte epitopes in slow progressors in HIV type 1 infection. AIDS Res. Hum. Retroviruses 12: 1691-1698. Migueles, S. A., M. S. Sabbaghian, W. L. Shupert, M. P. Bettinotti, F. M. Marincola, L. Martino, C. W. Hallahan, S. M. Selig, D. Schwartz, J. Sullivan, M. Connors. 2000. HLA B*5701 is highly associated with restriction of virus replication in a subgroup of HIV-infected long term nonprogressors. Proc. Natl. Acad. Sci. USA 97: 2709-2714. Gillespie, G. M., R. Kaul, T. Dong, H. B. Yang, T. Rostron, J. J. Bwayo, P. Kiama, T. Peto, F. A. Plummer, A. J. McMichael, S. L. Rowland-Jones. 2002. Cross-reactive cytotoxic T lymphocytes against a HIV-1 p24 epitope in slow progressors with B*57. AIDS 16: 961-972. McNeil, A. J., P. L. Yap, S. M. Gore, R. P. Brettle, M. McColl, R. Wyld, S. Davidson, R. Weightman, A. M. Richardson, J. R. Robertson. 1996. Association of HLA types A1–B8-DR3 and B27 with rapid and slow progression of HIV disease. Q. J. Med. 89: 177-185. Goulder, P. J., C. Brander, Y. Tang, C. Tremblay, R. A. Colbert, M. M. Addo, E. S. Rosenberg, T. Nguyen, R. Allen, A. Trocha, et al 2001. Evolution and transmission of stable CTL escape mutations in HIV infection. Nature 412: 334-338. Kaslow, R. A., R. Duquesnoy, M. VanRaden, L. Kingsley, M. Marrari, H. Friedman, S. Su, A. J. Saah, R. Detels, J. Phair, et al 1990. A1, Cw7, B8, DR3 HLA antigen combination associated with rapid decline of T-helper lymphocytes in HIV-1 infection: a report from the Multicenter AIDS Cohort Study. Lancet 335: 927-930. Gao, X., G. W. Nelson, P. Karacki, M. P. Martin, J. Phair, R. Kaslow, J. J. Goedert, S. Buchbinder, K. Hoots, D. Vlahov, et al 2001. Effect of a single amino acid change in MHC class I molecules on the rate of progression to AIDS. N. Engl. J. Med. 344: 1668-1675. Jin, X., X. Gao, M. Ramanathan, Jr, G. R. Deschenes, G. W. Nelson, S. J. O’Brien, J. J. Goedert, D. D. Ho, T. R. O’Brien, M. Carrington. 2002. Human immunodeficiency virus type 1 (HIV-1)-specific CD8+-T-cell responses for groups of HIV-1-infected individuals with different HLA-B*35 genotypes. J. Virol. 76: 12603-12610. Hendel, H., S. Caillat-Zucman, H. Lebuanec, M. Carrington, S. O’Brien, J. M. Andrieu, F. Schachter, D. Zagury, J. Rappaport, C. Winkler, et al 1999. New class I and II HLA alleles strongly associated with opposite patterns of progression to AIDS. J. Immunol. 162: 6942-6946. Diouf, K., A. D. Sarr, G. Eisen, S. Popper, S. Mboup, P. Kanki. 2002. Associations between MHC class I and susceptibility to HIV-2 disease progression. J. Hum. Virol. 5: 1-7. O’Connor, D. H., B. R. Mothe, J. T. Weinfurter, S. Fuenger, W. M. Rehrauer, P. Jing, R. R. Rudersdorf, M. E. Liebl, K. Krebs, J. Vasquez, et al 2003. Major histocompatibility complex class I alleles associated with slow simian immunodeficiency virus disease progression bind epitopes recognized by dominant acute-phase cytotoxic-T-lymphocyte responses. J. Virol. 77: 9029-9040.
den Uyl, D., I. E. van der Horst-Bruinsma, M. van Agtael. 2004. Progression of HIV to AIDS: a protective role for HLA-B27?. AIDS Rev. 6: 89-96. Nelson, G. W., R. Kaslow, D.L. Mann. 1997. Frequency of HLA allele-specific peptide motifs in HIV-1 proteins correlates with the allele’s association with relative rates of disease progression after HIV-1 infection. Proc. Natl. Acad. Sci. USA 94: 9802-9807. Migueles, S. A., A. C. Laborico, H. Imamichi, W. L. Shupert, C. Royce, M. McLaughlin, L. Ehler, J. Metcalf, S. Liu, C. W. Hallahan, M. Connors. 2003. The differential ability of HLA B*5701+ long-term nonprogressors and progressors to restrict human immunodeficiency virus replication is not caused by loss of recognition of autologous viral gag sequences. J. Virol. 77: 6889-6898. Goulder, P. J., D. I. Watkins. 2004. HIV and SIV CTL escape: implications for vaccine design. Nat. Rev. Immunol. 4: 630-640. Leslie, A., D. Kavanagh, I. Honeyborne, K. Pfafferott, C. Edwards, T. Pillay, L. Hilton, C. Thobakgale, D. Ramduth, R. Draenert, et al 2005. Transmission and accumulation of CTL escape variants drive negative associations between HIV polymorphisms and HLA. J. Exp. Med. 201: 891-902. Currier, J. R., M. E. Harris, J. H. Cox, F. E. McCutchan, D. L. Birx, S. Maayan, G. Ferrari. 2005. Immunodominance and cross-reactivity of B5703-restricted CD8 T lymphocytes from HIV type 1 subtype C-infected Ethiopians. AIDS Res. Hum. Retroviruses 21: 239-245. Price, D. A., P. J. R. Goulder, P. Klenerman, A. K. Sewell, P. J. Easterbrook, M. Troop, C. R. M. Bangham, R. E. Phillips. 1997. Positive selection of HIV-1 cytotoxic T lymphocyte escape variants during primary infection. Proc. Natl. Acad. Sci. USA 94: 1890-1895. Klenerman, P., S. Rowland-Jones, S. McAdam, J. Edwards, S. Daenke, D. Lalloo, B. Koppe, W. Rosenberg, D. Boyd, A. Edwards, et al 1994. Cytotoxic T-cell activity antagonized by naturally occurring HIV-1 Gag variants. Nature 369: 403-407. McAdam, S., P. Klenerman, L. Tussey, S. Rowland-Jones, D. Lalloo, R. Phillips, A. Edwards, P. Giangrande, A. L. Brown, F. Gotch, et al 1995. Immunogenic HIV variant peptides that bind to HLA-B8 can fail to stimulate cytotoxic T lymphocyte responses. J. Immunol. 155: 2729-2736. Reid, S. W., S. McAdam, K. J. Smith, P. Klenerman, C. A. O’Callaghan, K. Harlos, B. K. Jakobsen, A. J. McMichael, J. I. Bell, D. I. Stuart, E. Y. Jones. 1996. 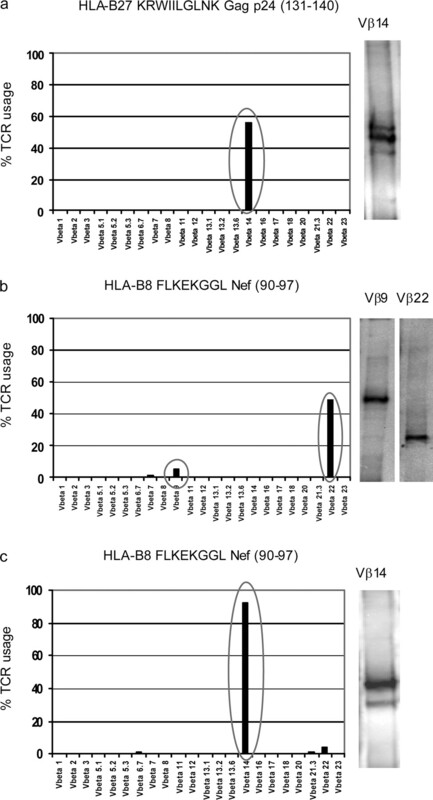 Antagonist HIV-1 Gag peptides induce structural changes in HLA B8. J. Exp. Med. 184: 2279-2286. Wilson, J. D., G. S. Ogg, R. L. Allen, P. J. Goulder, A. Kelleher, A. K. Sewell, C. A. O’Callaghan, S. L. Rowland-Jones, M. F. Callan, A. J. McMichael. 1998. Oligoclonal expansions of CD8+ T cells in chronic HIV infection are antigen specific. J. Exp. Med. 188: 785-790. Price, D. A., S. M. West, M. R. Betts, L. E. Ruff, J. M. Brenchley, D. R. Ambrozak, Y. Edghill-Smith, M. J. Kuroda, D. Bogdan, K. Kunstman, et al 2004. T cell receptor recognition motifs govern immune escape patterns in acute SIV infection. Immunity 21: 793-803. Weekes, M. P., M. R. Wills, K. Mynard, A. J. Carmichael, J. G. Sissons. 1999. The memory cytotoxic T-lymphocyte (CTL) response to human cytomegalovirus infection contains individual peptide-specific CTL clones that have undergone extensive expansion in vivo. J. Virol. 73: 2099-2108. Argaet, V. P., C. W. Schmidt, S. R. Burrows, S. L. Silins, M. G. Kurilla, D. L. Doolan, A. Suhrbier, D. J. Moss, E. Kieff, T. B. Suclley, et al 1994. Dominant selection of an invariant T cell antigen receptor in response to persistent infection by Epstein-Barr virus. J. Exp. Med. 180: 2335-2340. Selin, L. K., R. M. Welsh. 1994. Specificity and editing by apoptosis of virus-induced cytotoxic T lymphocytes. Curr. Opin. Immunol. 6: 553-559. Siliciano, R. F., M. J. Soloski. 1995. MHC class I-restricted processing of transmembrane proteins: mechanism and biological significance. J. Immunol. 155: 2-5. Chen, Z. W., Y. Li, X. Zeng, M. J. Kuroda, J. E. Schmitz, Y. Shen, X. Lai, L. Shen, N. L. Letvin. 2001. The TCR repertoire of an immunodominant CD8+ T lymphocyte population. J. Immunol. 166: 4525-4533. Jansen, C. A., S. Kostense, K. Vandenberghe, N. M. Nanlohy, I. M. De Cuyper, E. Piriou, E. H. Manting, F. Miedema, D. van Baarle. 2005. High responsiveness of HLA-B57-restricted Gag-specific CD8+ T cells in vitro may contribute to the protective effect of HLA-B57 in HIV-infection. Eur. J. Immunol. 35: 150-158.